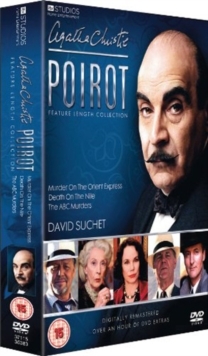 Collection of three feature-length episodes from the TV series based on Agatha Christie's classic murder mystery novels. In 'Murder On the Orient Express' the Belgian moustache-twirling detective, Hercule Poirot (David Suchet), is travelling from Istanbul to England aboard the Orient Express when a man, who appears to be a stranger to the other passengers, is killed. While the train is caught in a snowdrift Poirot attempts to reveal who is responsible. In 'Death On the Nile' (2004) young heiress Linnet Doyle (Emily Blunt) is murdered while enjoying a pleasure cruise down the Nile with her new husband, Simon Doyle (J.J.
Feild), aboard a luxury liner occupied by a diverse set of extremely wealthy passengers. In 'The ABC Murders' an anonymous serial killer has been taking his victims in alphabetical order.